In this episode, we’re cracking open a real-life mysterious tome written in half-mad scribblings (no, not that one), and correct the record on its game stats. Plus, we talk about our alma mater, and why it makes for such a great home base. This episode was recorded on June 29, 2014. Check out the animated filmThe Lurking Fear. Warning: it's not an adaptation of the HPL story, but it's got a rich Lovecraftian center. Charles Gerard (Keeper Chad) has been named as one of the authors in a stretch goal PDF for the upcoming Invictus book, Golden Goblin's next Kickstarter! His first pro-published scenario! The main book is called De Horrore Cosmico, and features some heavy-hitters in the CoC writing world. Each scenario is inspired by an HP Lovecraft story. The stretch goal PDF is called Terror on the Borderlands. 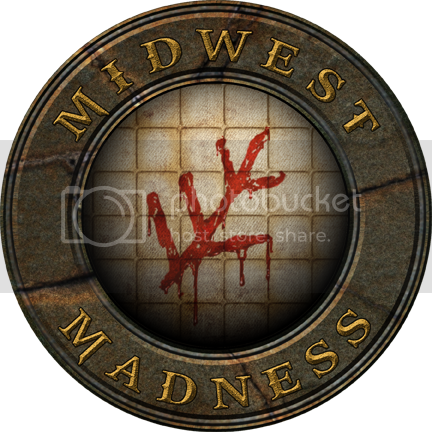 This week, in keeping with our main show topic, why not check out the Chaosium-licensed Miskatonic University website, which is still alive after more than 15 years! Cryptocurium is proud to announce the opening of their Etsy store! Folks can look forward to one of a kind exclusives to be offered in the store as well as some discontinued items in the near future. And if you haven't seen it yet, check out the "Houdini's Secret" Prop Collections. 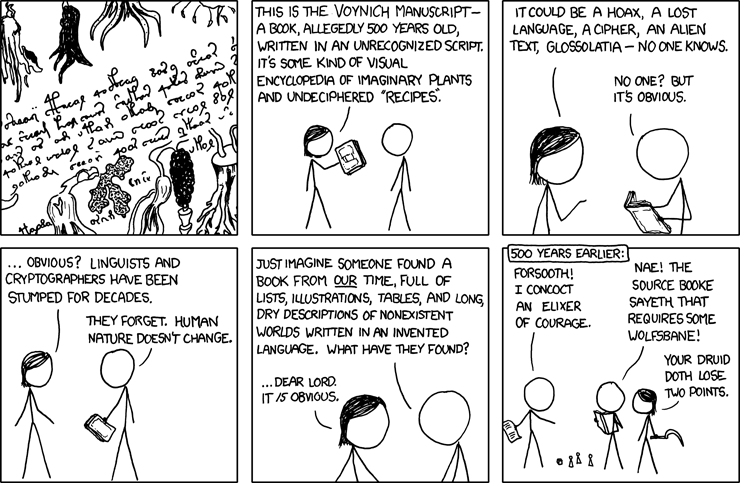 This week, we're exploring the Voynich manuscript, a real-life tome that might have helped to inspire Lovecraftian inventions like the Necronimicon. Ken &amp; Robin Talk About Stuff covered the book in episode 65. This is great place to start for the basics. The Voynich segment starts around 1 hour and 3 minutes into the show. Later, they covered recent news of a partial decoding in Episode 79. We dug up the actual academic article about the partial decoding. The book was covered in an episode of Blurry Photos. A page of detailed history background. A link to the Beinecke Library, where the actual tome is kept. Or buy your very own reproduction. It gets plenty of mentions on YSDC. And more on a website called "Wikipedia." Oh, and Chad mentions the old 90s TV show, Friday the 13th, as a model for a possible artifact-collection campaign surrounding the curiosity cabinet of Holy Roman Emperor Rudolf II. 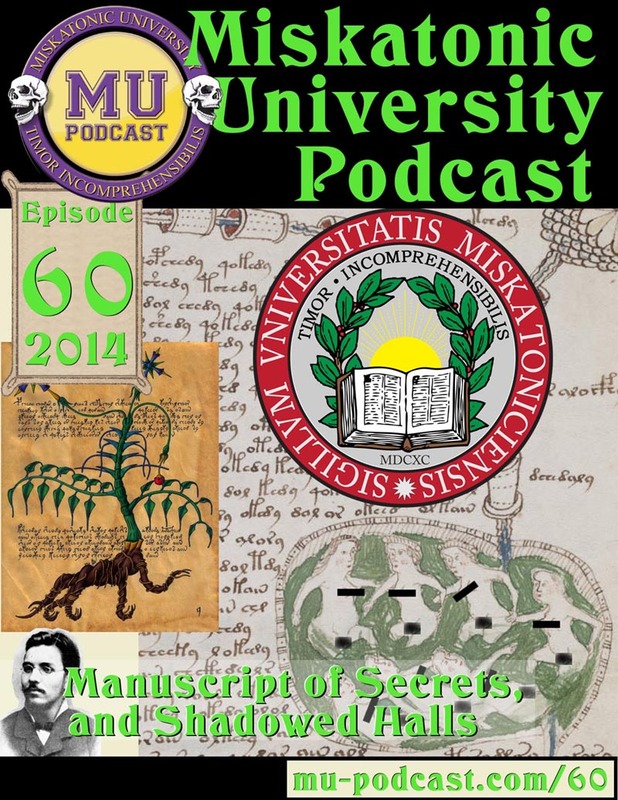 This episode we take a look at the merits of Miskatonic University as a game setting. Along the way, we mention Harvard's tunnel system, which might have inspired Chaosium writers to include an underground network for Miskatonic U. And check out a fascinating episode of Radiolab about living cancer cells and the woman whose flesh spawned scientific breakthroughs without even knowing it. Dan here- Sorry for the delay in the release. I was out of town this weekend and had a delay in the edit. Like Keeper Chad, I'm very pleased to be part of the upcoming stretch goal of Golden Goblin Press' Kickstarter mentioned in this episode. My scenario is entitled "A Balance of Blood". I'm sure we'll hear more about the Kickstarter and stretch goals as Sept. 12th approaches! Great show guys! Out of the Secrets or similar sourcebooks, Secrets of San Fransisco & the Miskatonic U are my favorites & so much insane depth to them both that they're highly recommended. I think it would be a fun idea to take the Miskatonic U rules for making college student junior investigators to go about all the local strangeness then build the group out to Arkham & the rest as they grow. I like the idea though of going through the Investigator Companion book to go after the smaller in popularity professions like the janitor or whatnot to make the game much more interesting at sneaking around without being noticed to find more clues. Congrats on the kickstarter in the future, sounds like a lot of fun in store for Cthulhu gaming. Good episode! It was riveting enough to get me to register an account to respond. One thought I've had is how to use Miskatonic University in a modern setting. Rather than making it still an Ivy League-quality school, I like to think that it fell on hard times after a series of disasters and misadventures in the 1920's. Its reputation began to decline, and along with it went the enrollment figures and endowment. Now Miskatonic University is just a shadow of its old glory. Several of the science building rooms have been closed off as environmentally unsafe, and what labs do remain open have pathetically outdated and often unreliable equipment. The Archaeology and Anthropology department hasn't sponsored any new international field work since the embarrassing Syrian dig back in '86, and it's developed a reputation as a haven for cranks and disgraced academics who have lost positions at finer institutions (though a few professors still have a good reputation for their work on local pre-Columbian sites in Massachusetts and Vermont). Still, the library is very well maintained, and still in its original Gothic Revival building -- the librarians lament that it hasn't outgrown its facility in 90 years, blaming the meager acquisitions budget. But some of the old endowments from certain early 20th century Arkham antiquarians still generate purchasing resources, though these are often earmarked for rather obscure subject areas due to specifications in their creators' wills (the Gilman endowment for higher mathematics and New England folklore is a case in point). The result is a collection that gets older, stranger, and less relevant to a modern curriculum every year. The Armitage Special Collections are still quite well curated, and protected by unusually high tech security systems (according to rumor, some sort of ongoing government grant funds their continual improvement). In short, modern Miskatonic University is a relic, perhaps of interest to students seeking a particular old-timey aesthetic type of college experience, or to the scions of old Arkham families whose legacy status can garner them cheap tuition. But for the most part, the contemporary academy pays it little attention, except perhaps as a cautionary story about what can happen to a "former Ivy" through mismanagement of resources and excessive ambition. The story Murph was trying to come up with was "The Disciple", by David Barr Kirtley. 2. Janitorial characters at MU. Go Pods!